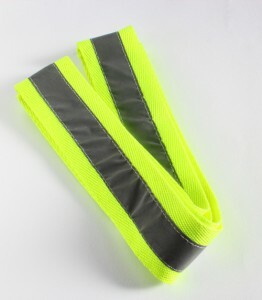 Used for safety products such as vest, sash, armband, road sign. Cutting processing for sewing is possible. We have a good track record of supply to various government projects. Light is reflected in the same direction as incident light using optical refraction of glass beads arranged on base fabric. We produce many kinds of reflective clothes and films such as high luminance type, self-emitting light type, phosphorescence type, ecological type and so on… These are mainly used for safety vest, sash, and road signs that reflect light from sources such as headlight of automobile.